First, in all 16 countries (primarily in Europe and North America) in their survey, stocks outperformed bonds and gold over the long term and enjoyed a long-term upward tre wars, the Great Depression, runaway inflation, currency crises and other unstable conditions. 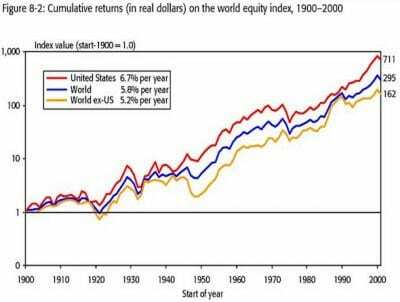 Second, U.S. stocks outperformed the rest of the world on a long-term basis. Since the start of the new millennium, nothing has changed. The U.S. stock market continues to outperform the rest of the world. Last month, the Brookings Institution just released a blockbuster report on the global economy and markets, concluding, “In dollar terms, U.S. stock market performance leaves all other countries in the dust.” Indeed, Wall Street has outperformed EVERYTHING this year except oil and marijuana stocks. Now you can see why we are 100% invested in U.S. stocks in my newsletter, Forecasts & Strategies — and outperforming even the U.S. stock indexes! You'll also receive Dr. Mark Skousen's weekly e-letter, Investor CAFE, at no cost, along with other associated financial content and special offers. Why does the United States outperform all the rest? Nobody knows for sure, but I suspect it’s because America is still the engine of technology and entrepreneurship. The best and the brightest show up on our shores and succeed in Silicon Valley and the rest of the country. America is still #1 in technology, patents, etc. This event is free to attend for my readers. Click here for details. O New Orleans Investment Conference, New Orleans Hilton, Nov. 1-3: This is the granddaddy of hard-money conventions. I’ll be there this year to speak on a controversial subject: “Investors, Beware! Why Gold Bugs and Austrian Economists Often Offer Bad Investment Advice.” They typically are right in theory, but their timing is off, and that can hurt your portfolio. Don’t miss other celebrity speakers including Mark Steyn, Jim Grant, Jonah Goldberg, Dennis Gartman, Rick Rule, Robert Kiyosaki and Brien Lundin. Be sure to mention you’re a subscriber when you register. To register, click here or call toll-free 1-800-648-8411. Update on Cruise to the REAL Cuba: Make a Reservation NOW! Big news: I’m organizing a private cruise to visit Cuba next year on November 9-16, 2019, aboard the five-star Oceania Insignia. I know it’s more than a year away, but cruises to Cuba are hot, and the cabin space is filling up fast. This week-long trip to Cuba is special — we will be given a private tour in Havana by a free-market economist who actually lives in Cuba and will show us parts of “communist-controlled” Havana that no one else sees. Greg Galloway, director of Fund Advisors of America, and I will update you on your investments. Dave Phillips, president of Estate Planning Specialists, will be talk about estate planning after the Trump tax cuts. I will also be giving a talk on the important economic and cultural differences between Latin America and North America. And my wife Jo Ann, an English professor, will speak on Ernest Hemingway and Cuba. This will be a small private conindividuals. We’ve already sold 12 cabins. Please call Nicole at the MoneyShow (who is organizing the cruise for us), toll-free, at 1-844-225-5838 for a free color brochure and to make a deposit. Cabins are available as little as $2,399 per person/double occupancy. But they won’t last. Call today. Nobel Prize for President Trump — in Economics? 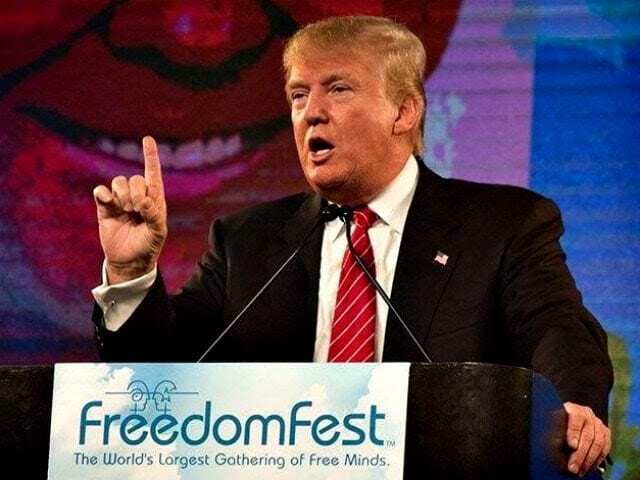 Donald Trump speaking at FreedomFest in 2015. Do his policies deserve a Nobel Prize? I was shocked to see that supply-side economist and friend Steve Moore “seriously” suggested that President Trump be given the Nobel Prize in Economics. Here’s the link to read the story. Talk about trying to ingratiate yourself to the president…. But maybe there’s a method to Moore’s madness: Perhaps Moore wants to make the economics prize equal to the Nobel Peace Prize, which is already a joke. If Moore is serious, then he’s terribly misguided or ill-informed about the Nobel Prize in Economics. It is given to professional economists who have made major contributions to economics, not to politicians who have a mixed message of sound and unsound economic policies. President Trump may deserve credit for pushing through tax cuts and deregulation, but he’s woefully ignorant about trade policy. He’s doing nothing to address the unfunded liability problem in Social Security, Medicare, etc. And since when do you give a Nobel Prize in Economics to a government leader who is running trillion-dollar deficits during an economic boom? Even Keynesians think we should be running surpluses right now. The way we are piling up debt in this country, we are heading for trouble. And when interest rates rise and a debt bomb explodes, we may well want to give President Trump and past U.S. presidents who share responsibility an “ignoble” prize in economics. Mark Skousen, Ph. D., Editor of Forecasts & Strategies, is a nationally known investment expert, economist, university professor, and author of more than 25 books. Currently, Dr. Skousen is a Presidential Fellow at Chapman University. He recently was named one of the 20 most influential living economists; in 2018, he was awarded the Triple Crown in Economics.